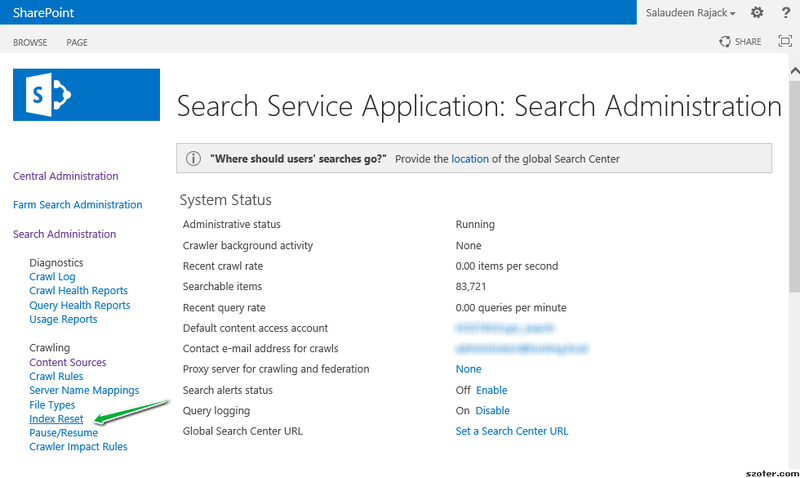 Problem: SharePoint 2013 search crawling process got stuck and we got to reset the corrupted search index. Solution: Follow these steps to reset search index in SharePoint 2013. In Search Administration page, Click on "Index Reset" link under crawling section of the left navigation menu. In the index reset page, click on "Reset Now" button to reset search index in SharePoint 2013. Before resetting search index, make sure no search crawls are in progress - Stop all search crawls, disable continuous crawl - otherwise, index reset may get stuck! After index reset, You must run full crawl to enable search results! Where, the $True parameter denotes: Disable Alerts & Ignore Timeout error. If you still get Timeout errors, Clear SharePoint configuration cache and then try again!